In FY 2016-2017, total income was AUD 5.6 million; total expenses were AUD 6.3 million. In 2016, APEHDA received €215,000 from Irish Aid (Ireland). APHEDA is the overseas aid agency of the Australian Council of Trade Unions. APHEDA leads “fact-finding” trips to Israel, the West Bank, and Gaza, disseminating an anti-Israel narrative to Australian politicians. The trip in July 2017 was scheduled to meet with Khalida Jarrar, Addameer’s former vice-chairperson. 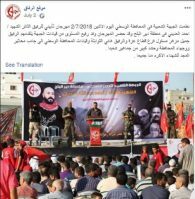 Jarrar is a senior Popular Front for the Liberation of Palestine (PFLP) official and was administratively detained on April 1, 2015 by Israeli security forces. On April 15, 2015 she was indicted for various offenses including active membership in a terrorist organization (the PFLP) and inciting violence through a call to kidnap Israeli soldiers to be used as “bargaining chips for the release of Palestinian prisoners.” Jarrar accepted a plea bargain and was reportedly convicted on “one count of belonging to an illegal organization and another of incitement” receiving a 15-month prison sentence with an additional 10-month suspended sentence. She was released from prison on June 3, 2016. According to Addameer, Jarrar was re-arrested in July 2017 for six months. In December 2017, the detention was extended by another six months to July 2018. In December 2014, APHEDA hosted a Q&A from Gaza on “Resilience and Reconstruction,” featuring Jaber Qudyh from Ma’an Development Center and Mona el-Farra from the Middle East Children’s Alliance. During a July 2, 2011 hearing of the Australian Senate’s Foreign Affairs, Defence, and Trade Legislation Committee, Senator Eric Abetz asked officials from the Australian Agency for International Development questions regarding funding to APHEDA.